(NaturalNews) You've probably heard that purple foods — from blueberries to purple versions of foods such as potatoes — are particularly good for your health, and you may have wondered what's behind this effect. In fact, it literally is the purple color itself that's good for you — the pigments that give foods their purple color are a family of potent antioxidants known as anthocyanins. Studies have linked anthocyanins to lowered risk of cancer, cardiovascular disease, neurological disease, cognitive decline and Alzheimer's disease. They also appear to help control — and possibly prevent — obesity and diabetes, in part by inhibiting certain digestive enzymes and helping control levels of blood sugar. They are potent anti-inflammatories, and are therefore also likely to reduce the risk of most chronic diseases. So how can you boost your intake of these super-antioxidants? Primarily by eating deep red, blue and purple fruits and vegetables. This includes all berries, including strawberries, as well as other fruits including cherries, pomegranates and plums. Some vegetables are only high in anthocyanins if you pick the variety with the right color: purple sweet potatoes, red onions and purple cabbage, for example. Other high-anthocyanin vegetables include beets and eggplant. 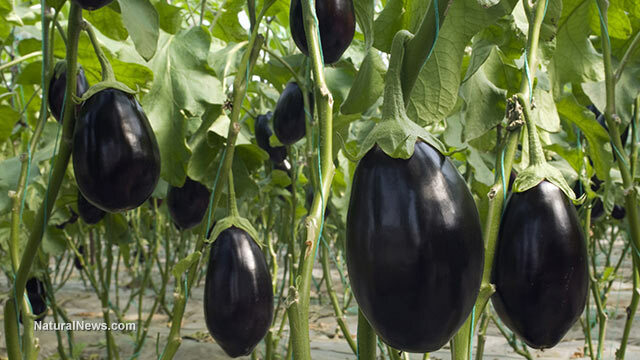 In the case of eggplant, be sure not to throw away the skin, as that's where most of the anthocyanins reside. The skin is also high in fiber, potassium and magnesium. The skins of red and purple grapes are of course a good source of anthocyanins, which also makes red wine a good source of this antioxidant. Along with resveratrol (another powerful antioxidant), anthocyanins may be responsible for many of the remarkable health benefits of red wine. All of the above are foods that are relatively easy to come by. But if you're in the mood for something that's less common in the US diet, there are some other anthocyanin-rich foods you can try. One of these is guava fruit, and particularly the blue-green peels. Another is black rice, or, if that's too expensive, Kerala Red rice. Both of these are natural varieties of rice — not to be confused with genetically modified "Golden Rice." Can your bread be purple, too? A new source of anthocyanins may also soon be making its way to a grocery store near you: "purple bread," the invention of National University of Singapore food scientist Zhou Weibiao. Zhou extracted the anthocyanins from black rice and infused them into the bread flour. The final results were surprising. "Despite its antioxidant capacity and associated health benefits, the knowledge of using anthocyanins as an ingredient in food products is very limited," Zhou said. Even though the bread is baked at 200 degrees Celsius (400 degrees Fahrenheit), it retains 80 percent of the original antioxidant content of the flour. Remarkably, a chemical reaction between the anthocyanins and the starch also causes the carbohydrates in the bread to be absorbed 20 percent more slowly than usual, thus lowering the normally high glycemic index of white bread. "If you want to enjoy the texture of white bread and slow down digestion, this is probably the best formula," Zhou said. "And the color isn't bad, either." Although CNN has hailed the bread as "the first superfood of the baked goods world," such praise may be premature. For one thing, the bread is not yet commercially available. For another, it is still made from white flour, not whole wheat. "The challenge was to see if we could change the formula of bread, without changing the smooth texture of white bread that people really love," Zhou said. "You are eating the same amount of starch and wheat flour, so the nutritional value is the same. The key idea here is slowing down the energy release, so you use those calories over a longer period of time." But really, did you expect any manufactured product to be able to replace good, old-fashioned fruits and vegetables? Is cabbage the ultimate anti-cancer food?